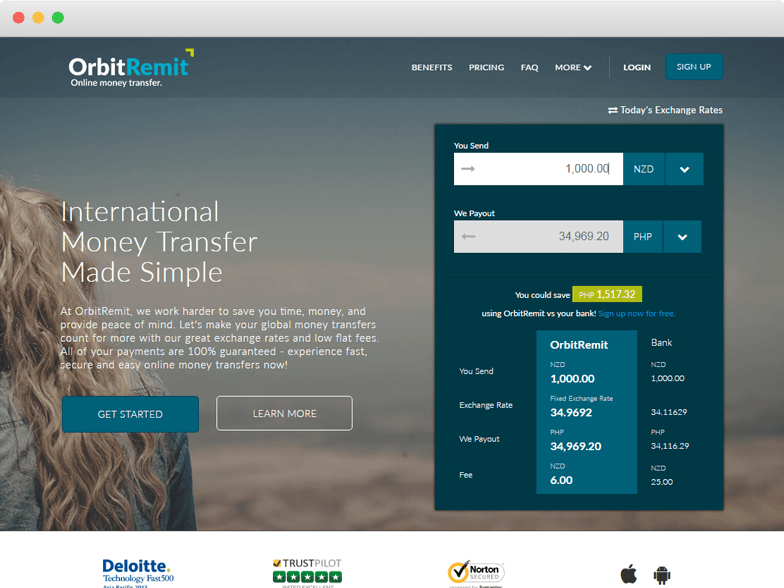 All the useful information that you need to know before sending money with Orbit Remit! Launched in the year 2009, OrbitRemit is a New Zealand-based company where one can transfer funds to 40 countries in more than 12 currencies. The company has its headquarters in New Zealand with offices in Australia and the UK. It lets you make fee-free payments to the New Zealand Inland Revenue Department (IRD). One can also use it to pay fines or to make payments for social development in New Zealand. For using the services of OrbitRemit, one can send amount only through a bank account as it does not accept the debit and credit cards. So no matters if you are doing a personal transfer or business transfer, you have to pay the amount from the bank account only. It has recently started a cash pick-up service in Vietnam and the Philippines. One has to transfer the minimum amount of $50 or the same amount in any other currency through OrbitRemit. The maximum amount one can transfer with fees is up to 10,000 in any currency. Above it, the com+pany does not charge any fee from the customer. So, in short, there is no maximum transfer limit in OrbitRemit. The company is highly secured as its application is secured by the most secure Norton SSL certificate. At the same time, it is offering 24*7 customer assistance on its toll-free number. However, it does not support chat as many customers look for that. So, on an overall basis, we rate it 8.5 out of 10. Pricing : How much does Orbit Remit cost? The transfer fee in OrbitRemit is flat and fixed. At the same time, it also depends on the country where you live and where you are sending the funds. If you send money from the UK, you have to pay the flat fee of GBP2 in most of the countries. If you are sending funds from Australia, you have to pay the flat fee of AUD $4 for most of the countries. OrbitRemit free transfer is offered if you transfer funds to India. From New Zealand, you have to pay the fee of NZD $5 for most of the countries. The company offers a bit lower price than that of price existing in the market. It earns from the small difference in price which they get from the market and offer to the customers. The company does not charge any other fee from its customers. They have to pay which is shown on the transaction page. Even they offer free transfers above 10,000 in any currency. So, here we rate OrbitRemit 8 out of 10. Transparency: Does Orbit Remit have any hidden fees? The company does not charge any hidden fees from the customers. The recipient will receive the amount that has been shown on the transaction page to the sender. The company does not provide any number to track the transfer. You can see the transaction details on the dashboard and they will notify about the same through email. So, on the basis of transparency, we rate it 8 out of 10, because it has no hidden fees, but at the same time, it is providing any simple tracking procedure. Transfer Speed: How long does it take to send money through Orbit Remit? The company releases the funds as soon as it receives the funds from customers. But further, it all depends on the cut-off time and working hours of the banks in the country you are sending funds to. For example, the cut-off time in Australia is 6 pm (AET) while the banks of New Zealand works till 8 pm, 10 pm or 12 am. So, it can transfer funds within one business day, but this can be delayed to 3-5 working days depending on the country and currency. OrbitRemit does not offer instant transfers like many of its competitors. Therefore, we rate it 7 out of 10 for its transfer speed. Security : Is Orbit Remit Safe? It’s very much essential to stay safe and secure when you do online transactions because hackers try to steal the personal details which can affect you personally as well as financially. But when you are transacting through OrbitRemit, you need not to worry because the company is using high privacy policies to conduct lawful and fair business. The Financial Conduct Authority (FCA) in the United Kingdom is regulating it. It is authorized by other governmental regulatory in other countries to keep the details of its customers safe. So, on the basis of security, we rate it 9 out of 10. The company has a customer support number in all the three countries it is serving in. One can call anytime 24*7 with their queries. The company offers both Android and iOS apps to the customers. You can download the apps here. The company provides a unique link to the customers to share with their friends and family. When they complete the first transfer using your link, it will credit GBP £75 or AU/NZD $150 in your OrbitRemit account. The company shares various promo codes with the customers to provide them discount through email as well as SMS. One can use these promo codes in the available time to take the benefit of discounted fee. On overall user experience, we rate it 8 out of 10, as there are many areas where it can grow to become a top money remittance company. For using the services of OrbitRemit login here. Coverage: How many Countries & Currencies does Orbit Remit support? The company is offering its services in very few countries and has the potential to grow more. Therefore, we rate it 7 out of 10 for its coverage. So, if you want to transact with OrbitRemit sign up here. Orbit Remit is one really great company and very reliable. Their customer care is great with a reply within a few hours.They offer great exchange rates and only charge AU $4.00 per transaction. Some companies offer same day tranactions but you pay for that privilege. Very good rates of exchange, and good personal service. My only complaint is the website for new users. Seems designed to make it easy for the IT folks without considering the customers. Easy access, Fast and reliable. I love it free to send money home to student loan so many bonuses lov it have been using it for over 7 years!!! Extremely fast transfer. Will definitely make it my regular mode of money transfer!! Fast transaction...would really be the best if they could beat western union's exchange rate but will definitely recommend to my friends. Very fast and cheap fees..
Quick easy. What more can you say. I am a new customer and I need some time. But at this moment it is good. I am happy with the service. I think you need to check all the details before processing the payment. Should not allow client to process the payment unless and until all details are correct so the transfer process becomes smooth. Go to the OrbitRemit website. Enter the amount and select the currency of the recipient’s country. Click on “Sign up now for free” at the bottom of the currency calculator. Here sign up by entering your email ID and password. Enter all the personal details including bank account number, phone number and submit virtual government ID. Enter all the details of the recipient.